Sentinel Care Services provides dedicated and flexible domiciliary home care to people across Shropshire, Telford & Wrekin and Staffordshire. 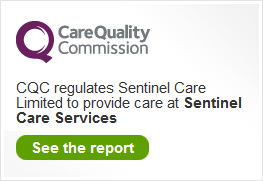 Run by Steve and Sally Harris, who have over 20 years’ experience in care, Sentinel has a personal touch, always try to maximise your opportunities for independence and can tailor services to the specific needs of anyone they care for. Here at Sentinel, we have chosen Bloodwise as our charity as it is such a worthy charity. We are always looking for our next event to raise as much funds and awareness as possible. Contact us today to find out how we can help you or somebody you know to maximise your opportunity for an independent life. Winter is coming – Are you winter ready? Ever considered a career in care? It can be a hugely rewarding job, ideal for compassionate and dedicated people. Sentinel offers a variety of entry level jobs as well as training and progression routes to work your way up the ladder. Being an independent, family run company Sentinel can work with you to get the most out of your career and offer you the role that best suits you. If you’re interested find out more here.